An HVLP paint sprayer is often used for "smaller" projects. Think of doors, frames, a few walls, etc. Nearly all paints can be applied with an HVLP paint sprayer. An HVLP paint sprayer is a device that uses air pressure to create a mist of paint. A compressor blows air through the hose to the spray gun at the end. Attached to the spray gun is a cup filled with paint, lacquer or stain which gets drawn in by the airflow. Once in contact with air, the paint gets blown out through a small opening (the nozzle or tip) and at that moment turns into mist. HVLP stands for high volume, low pressure, which in this case means a high volume of paint under low air pressure. The advantages of HVLP include its ease of use – you don’t need to be handy (little technical skill required) and cleaning is very easy as well. Only the cup and gun come in contact with the paint. The finish is often smoother than what you can get with a roller or brush. It is also very easy to get into corners or other difficult transition points and paint very intricate surfaces. 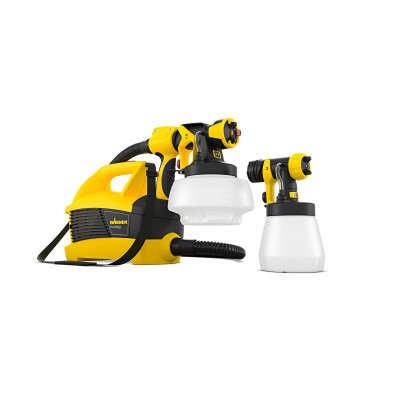 There is a wide range of HVLP paint sprayers available for the consumer. In this range, the Wagner Universal Sprayer 950 and Wagner Universal Sprayer 890 are the undisputed market leaders. 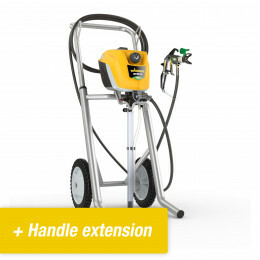 The higher you get in the HVLP range, the more capacity these paint sprayers have and the more applications they have. A higher capacity allows you to process thicker paint and also obtain a finer mist. This is why the Wagner Universal Sprayer 950 and the Wagner Universal Sprayer 890 are so popular. Both machines have relatively great capacity and are used very widely. Nevertheless, there are smaller machines that offer equally powerful solutions. For smaller areas, like an item of furniture or part of a fence, you can choose a handheld device such as the W590. And then the W950 is ideal for various walls and ceilings, while the W890 can handle about anything. 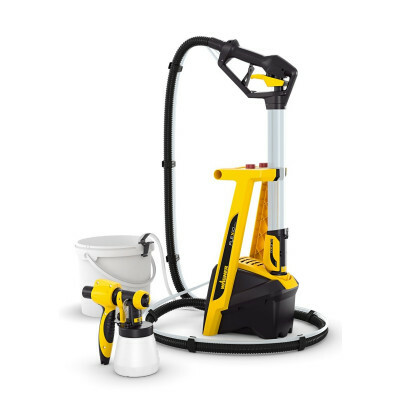 The machine can paint single walls or ceilings and with the included fittings it can handle all sorts of lacquers and stains. The Wagner HVLP Universal Sprayer W950 draws paint directly from the container which makes this HVLP sprayer extremely suitable for larger wall painting projects. If you need to paint only one wall or a single room every once in a while, then the Universal Sprayer 890 is the better choice. Do you need to spray a series of doors, windows, and cabinets and you need a top quality finish? 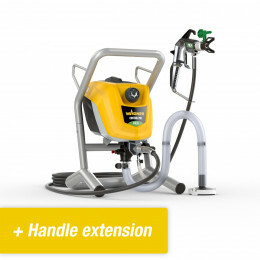 Then, in our range of HVLP paint sprayers, the XVLP paint sprayer is the best choice. Actually, you should regard the XVLP paint sprayer as an enhanced HVLP paint sprayer. It gives you all the advantages of HVLP technology, but with a higher quality spray pattern. 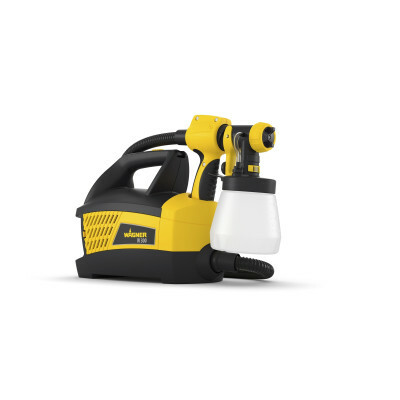 The best-selling XVLP paint sprayer is the Wagner XVLP 5000. It has three different spray heads. One for very fine lacquer, one for common varnishes and stains and the third for wall paint. HVLP stands for high volume, low pressure. It is a very old and proven technique in the world of paint sprayers. More than one of the first paint sprayers were based on this technique. HVLP is still one of the most popular techniques around. What does HVLP stand for and how should we see it in relation to HEA and Airless? HVLP technique is used especially for spraying small surfaces because HVLP sprayers work with a paint cup. A spray gun with a paint cup is less suitable for spraying large surface areas. On average, the cup holds enough paint to coat about 7 m2. If you want to spray larger areas, you will have to keep on refilling the cup. On the other hand, the HVLP is easy to use. Just fill the gun with paint and off you go. Compared to Airless, its has better preparation time, spray pattern, ease of use, simplicity of changing colors and cleaning. These features make it ideal for spraying varnishes, stains and wall paint (latex) on small areas. Incidentally, another HVLP model is the Wagner 950. It is the only one of its kind that is also suitable for larger consumer wall painting projects. 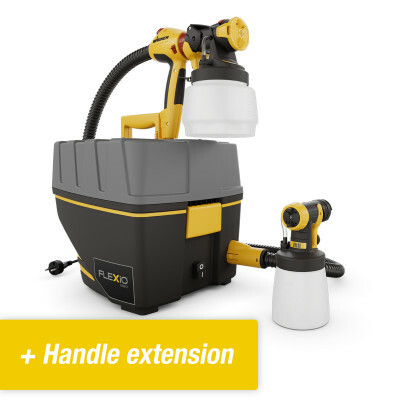 This hybrid model has a spray gun equipped with a paint cup for smaller projects and a spray gun without the cup for larger wall paint projects. Does HVLP technology have any disadvantages compared to other techniques? Definitely. The spray pattern is not as good compared to Airless and HEA (the technique with the most beautiful spray pattern) beats it hands down. Nonetheless, the finish you get with HVLP is always more attractive than what you can get with a roller or brush. If you have freshly plastered walls and want the smoothest result, we recommend using HEA. There is a slight difference in spray pattern with latex as the paint will flow a little more. But then again, you are probably not looking for a top quality result. You can use HVLP (except the Wagner 950) whenever you want to spray paint a wall, or a door, fence, garage door – indeed all the smaller projects found in and around the house. The worst spray pattern is always better than what you get with brush or roller!